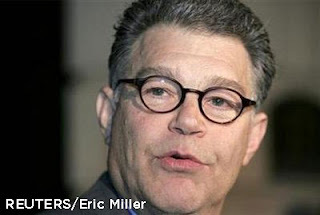 MINNEAPOLIS (HJ) – Democrat Al Franken was declared the winner of a Senate seat in Minnesota on Tuesday, ending one of the longest Senate races ever. Coleman quickly conceded once his five legal arguments were unanimously struck down by the Minnesota Supreme Court. About six hours following the decision, Senator Franken filed paperwork to collect the nearly six months back pay or about $87,000 for his senatorial position. A U.S. senator makes $174,000 a year with full medical benefits. It is unclear if Senator Franken will attempt to have his medical bill reimbursed for that time period as well. It was widely reported that Senator Franken had scrotoplasty following the last recount.